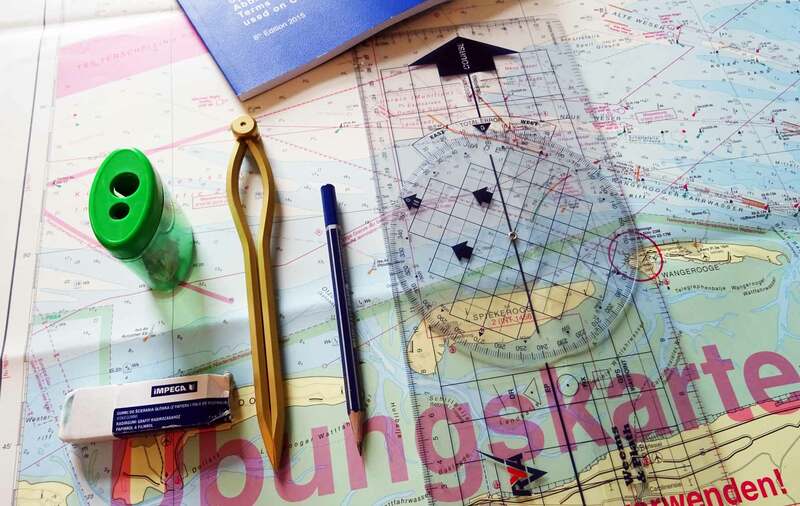 As my yachtmaster´s education goes on, I am now approaching one another milestone in acquiring the desired level of training: The SKS-Theory is my next goal. 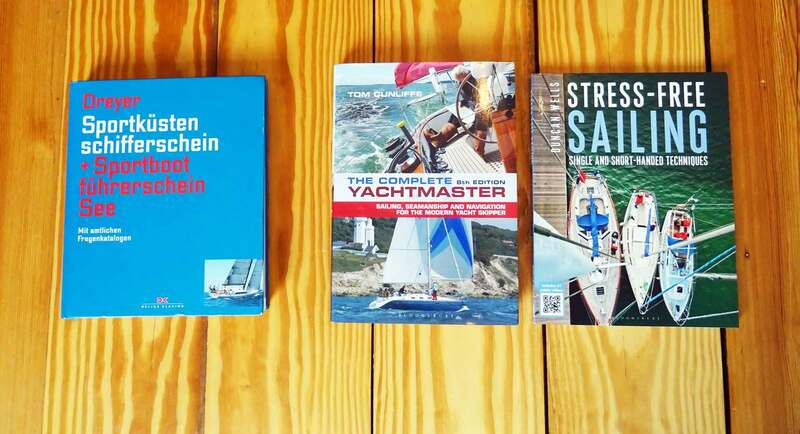 As I have mentioned in one of my previous posts, the so called “Sportkustenschifferschein” or abbreviated “SKS” is the German equivalent to the RYA Yachtmaster Coastal in terms of order, though both certifications cannot be compared as equal. Read the interview with Richard Jeske on that topic here he is going deeper into that topic. Now, having passed the practical part of the process after a 6-day intensive training cruise with examination (read it here and here) it´s the theoretical part left. Prior to the SKS I did already pass the SBF/Sportbootführerschein See, which is the legal license of being allowed to administer a pleasure craft in German waters (read it here) and the Short Range Certificate/SRC – the certification of being allowed to administer VHF maritime radio communication (read it here). Now, SKS Theory is feared and ill-reputed as very difficult. And indeed – it is! How do I cope with the SKS-theory, how could I learn and possibly pass the exam? Here´s what I´m doing. That´s what you essentially need. 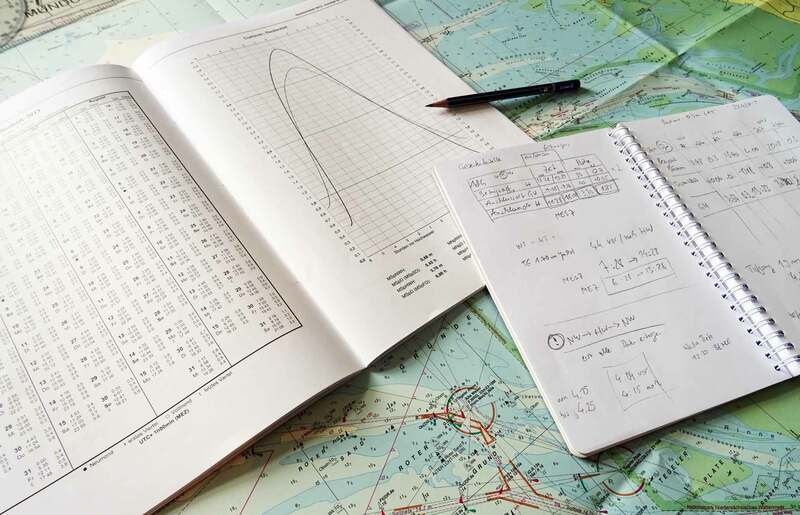 Second part of the examination – after a short break – is chart work. 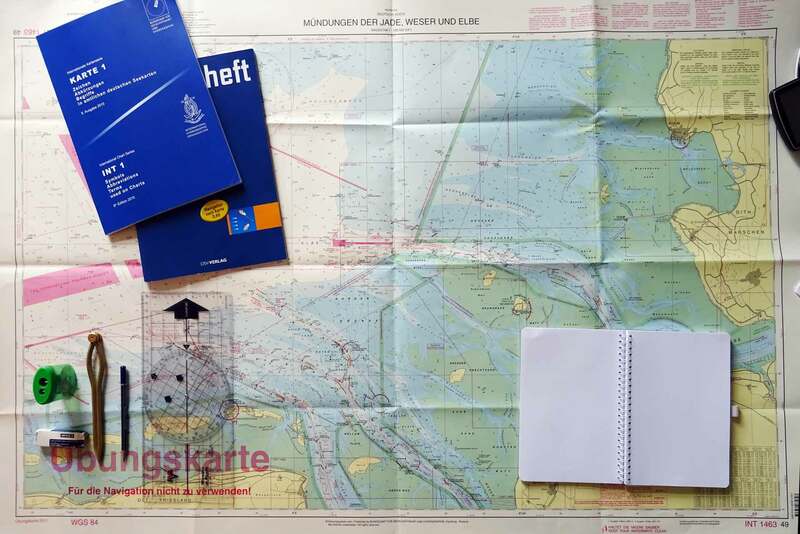 That´s the central part of the German SKS-education since this certificate is a proof of competence of the skipper´s ability of commandeering an oceangoing yacht. With all its consequences. So, naturally, the chart work is where sailing schools in Germany put most emphasis on. The navigational part of the SKS-exam consists of 18 questions/tasks of which a certain tolerance for failures is admitted, but there are crucial thing one must not fail since this part would be over all too soon. Again, there´s a last chance in an oral exam if a certain rate of error is not undercut. Drift is a different thing here, because one has to think a bit more abstract. There´s the first drift-calculation and a second one. Our teacher – whom I greatly admire and know from the SRC-class – gave a practical hint and something we won´t ever forget, at least until the feared examination day: “First drift calculation is applied when the skipper was dull. After a drift has put the yacht into lee and we want to calculate our offset.”, Hilmar explained. So, when drawing the vectors, drift has to be arranged after the plotted course. 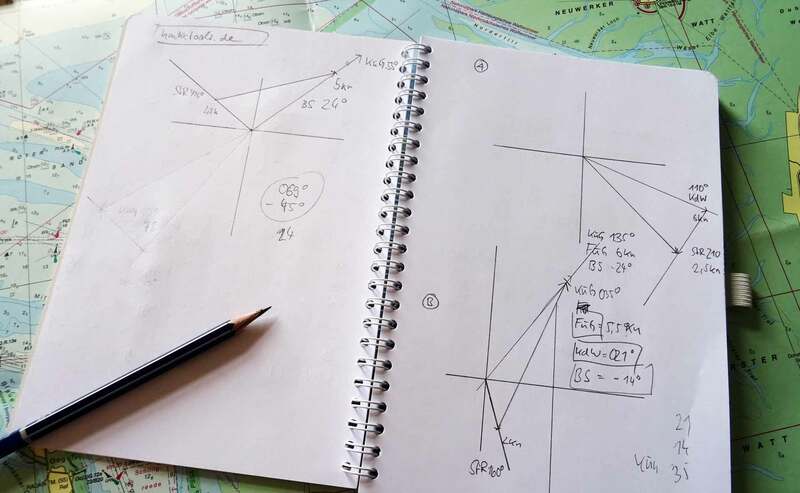 Drawing the vectors: Current offset is geometry. Same way around with the second drift calculation: “The skipper is a bit smarter here: He knows that drift will occur and wants to calculate correction angle before he casts off.”, he says. That means, angle of current force and speed has to be arrange at the beginning of the true course. It took quite a while for us to really permeate and apprehend the difference between these two things but again, it was not as tough as anticipated after we went home after the second day. Calculating set, drift and leeway as well as reading tables of where to expect which current in which directions with which speed became common sense. Well, that was before we went to the last and most complex part of the class: Tide calculations. Oh my, that´s really a stinker! 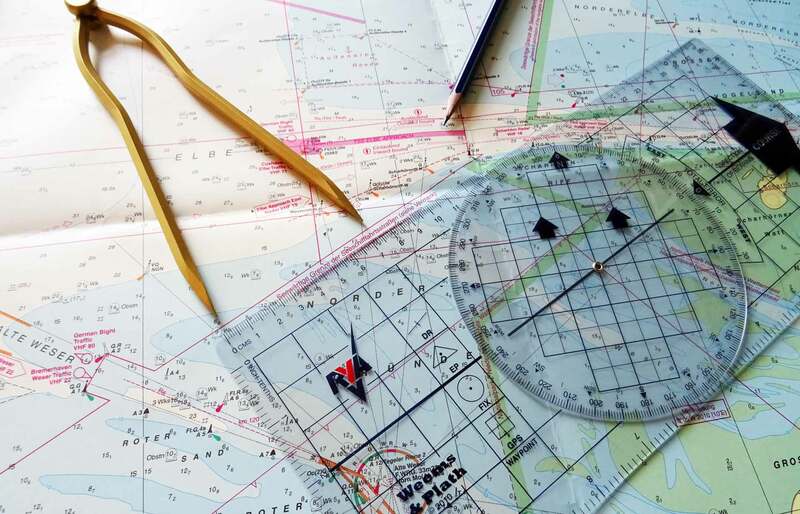 The skipper needs to get his information from no less than six different tables and charts in order to calculate things like tide range, expected depth at a certain time in a certain place, ranges of times of safe passages at given dates with certain ships (and their draft), safe/unsafe anchorages and all connected stuff. Tide calculations are … brain wrecking. To me. What´s so tricky about tide calculations – in my view – is the complexity of combining very different systems: Metric system, degrees, time, dates and – worst of all – the projection of local tides on to certain places far away from these referential places with calculating time delay. What makes it even worse: The hopping between UTC, CET and CEST. It´s a travel through time and space indeed: When does A happen in a and when does A happen in b with a delay of c? 6 tables! Honestly: I was lost! The rate of successfully solving the tasks plummeted to under 50 per cent and I was quickly discouraged after the first session. It got a bit better during the second, but to be quite frank here: That´s really tough stuff here! Here are two English books I can really recommend. Well, the big dining table of our family´s flat is occupied by the INT 1463 and I am going to work myself up and down through all of the 18 different forms with 18 questions each. Twice. Minimum. Apart from that, the whole course also is a big eye opener: For the fantastic – partially ancient – knowledge of nature, generations of seafarer´s rich know-how, the experience of eons of skippers and sailors roaming the seas, collecting facts and interpreting it´s forces and influence on weather, ships, tides and finally the well and woe of whole nations. Fascinating indeed, in a time where effortless GPS navigation makes everything so temptingly easy. Next Post	A Class 40 Racing Yacht. From Cardboard.